Going to the doctor can be a stressful experience. When patients arrive at your office, they may not only dealing with a medical issue, but might also be experiencing feelings of anxiety or frustration. Some patients are also burdened with worries about their financial situation and paying for medical costs. As your patients’ medical care provider, you want to do everything in your power to make them feel comfortable and relaxed during their visit. A great way to show your patients that your medical office is willing to go above and beyond to provide them with the best care is by installing privacy window film. 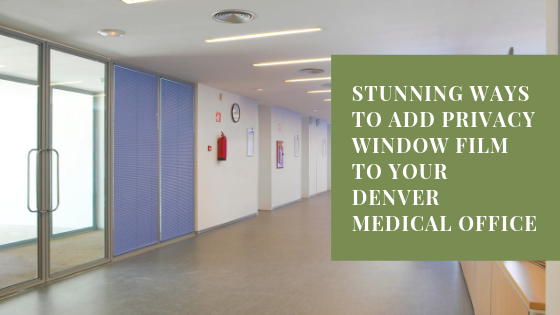 Denver medical facilities can use privacy window film to protect confidential information and create a welcoming atmosphere that puts patients at ease. Window film makes it easy and affordable to alter the interior of your Denver health care facility and create privacy for your patients. Here are just a few ways that you can use window film to create a more private, confidential setting. Add privacy to your lobby area. Anyone walking by your office can see into your lobby by looking through your windows. This may cause some patients to feel nervous, especially if they’re dealing with a sensitive medical issue. By adding window film to your lobby or waiting area, you can help patients feel more relaxed and secure. Use frosted window film to separate rooms. Frosted window films are great for doctors offices because they create privacy without blocking light. By installing frosted window film in patient rooms, storage closets, and staff break areas, you can create privacy without ruining the open feeling of your office. Get creative with color and texture. Not all privacy window films have a dark, tinted appearance. In fact, when it comes to selecting a privacy window film for your Denver medical office, you have numerous options to choose from. Add warmth, color, and style to your office by installing textured, patterned, or vibrant translucent films that create privacy where you need it. Solyx window films and HDClear films are great for creating privacy. At Green Light Window Films, we carry an extensive selection of privacy window films that are perfect for Denver medical offices. Contact us today to get a quote on professional window tinting for your medical facility.